Effortless, accurate cutting waits with this Bosch 10 in., 15 Amp Table Saw with Gravity-Rise Stand. Durable and portable with carry handles, the stand has 8 in. treaded, pneumatic wheels for the tough terrain of job sites. The saw offers a soft start for smooth, ramp-up speed and also helps you maintain speed under load. Other great features include single-point bevel movement for accuracy, T-slot miter system and enhanced dust collection. The user-friendly blade guard has a new split-guarding innovation for protection and a clean line of sight. A multi-position riving knife keeps material from pinching the blade. 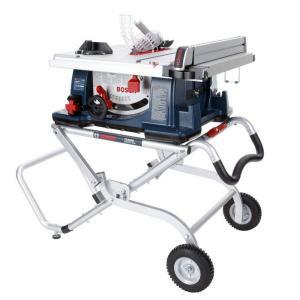 Tbook.com crawls the web to find the best prices and availability on Table Saws and related Tools and Hardware products like Bosch 15 Amp Corded 10 inch Worksite Table Saw with Gravity Rise Wheeled Stand. For this page, related items include products we find that match the following keywords: "Table Saw" at our vendor partner Home Depot. Bosch 15 Amp Corded 10 inch Worksite Table Saw with Gravity Rise Wheeled Stand is one of 60 Table Saws and related products listed in the Tools and Hardware section of Tbook.com If you have any questions on this product, please give us a call at 734-971-1210 during the hours of 9am - 5pm EST for assistance. Thank you for shopping at Tbook.com, the Internet Department Store!